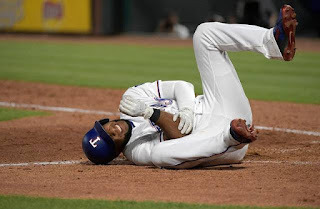 The Texas Rangers and fantasy baseball owners lost SS Elvis Andrus to a fractured right elbow last night, after being hit by a Keynan Middleton pitch. Andrus was swinging a hot bat, coming off a career year in which he hit 44 doubles and 20 home runs. However, the Rangers are off to a rough 4-10 start and have already seen Delino DeShields , Rougned Odor and Doug Fister placed on the disabled list. The Rangers have been outscored 77-44 this season, only the Miami Marlins have a worse run differential. It appears as though Jurickson Profar will get to play SS everyday moving forward. If you drafted Elvis around his ADP of 65, you are searching for a replacement at one of the weakest positions in all of fantasy sports. The other option would be to see if you already have someone on your roster who is SS eligible and then to add a (better) player at the other position.